Today Epson is announcing the release of two new full 1080p Interactive projectors, the BrightLink Pro 1450Ui and the 1460Ui. These new models reinvent the Whiteboard and turn any wall or existing dry-erase board into a 100-inch interactive display for more efficient meetings and collaboration, either in-room, or for remote meetings. 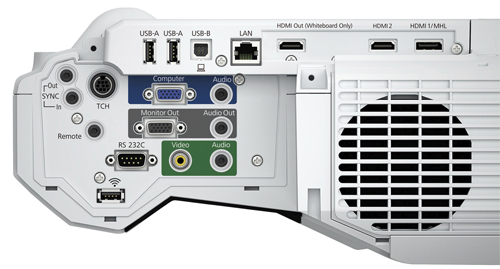 DVI-out connectivity - share whiteboard content on a larger display - ideal for video conferencing, large conference rooms, and training rooms. 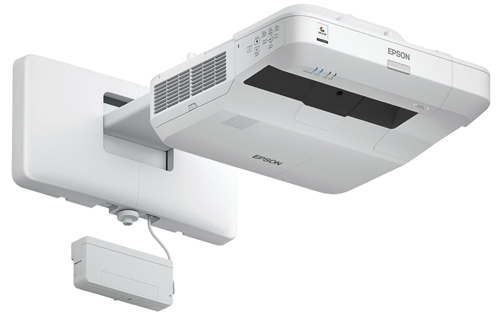 The 1450Ui and 1460Ui represent the third generation of Epson BrightLink Pro interactive projectors with improvements in both performance and features. Ease of use is a key design objective -- just walk in, turn them on, and start writing with your finger or the supplied pens. You can capture, save, and share display images instantly, and print or email them directly from the projectors. And both local and remote meeting participants can simultaneously annotate content from mobile devices, computers and other BrightLink Pros. How well would these work in a home entertainment environment compared to something like the GT5500 you just reviewed? Dixon, it will give you a brighter 100" picture which would be great for full ambient light use. However, for $3000 you would be paying for a lot of interactive features you would not be using. And it does not have a number of HT features like frame interpolation and 3D. For $3000 you could get the Epson 5040 which is not quite as bright, but is higher in contrast and fully loaded with home theater features. Of course the 5040 is not ultra short throw, so installation is a completely different smoke. And it is best used in a dark or low light setting, and can fill a much larger than 100" screen. Ultimately, everything is a trade off and you need to find the projector that has the features most important to you for your particular room and use requirements.